Right this is the place for any general chat about the TB. First as this is a Theme Build then there really are no rules as such, especially when compared to Group Builds. So for this one there is one rule and one guideline. The Rule ? Your build must involve a Panavia Tornado of some kind be it a variation on a real world variant or a development of the type, that existed on paper or indeed just in your brain. The Guideline ? 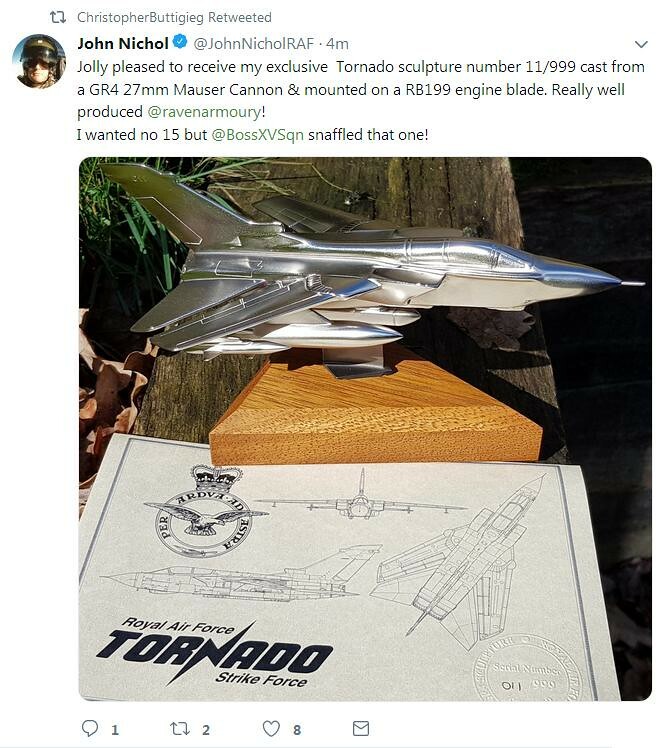 As we are using the build to to commemorate the Tornado's many years of active service it would be nice to get the builds completed by it's RAF retirement date - 31/3/19, but that's only a target. Re: Tornado retirement Theme Build general discussion. I haven't tried this manufacturer so any input concerning quality and customer service would be helpful. canuckdecals are ok, but /belcherbits decals are superior. In the original thread thete was the mention of the "EF3" sudgested as an enhanced version of the unofficial entitled version of the F3. This reminded me of a Hasegawa F3 I have put aside to build as the "EF3" so I may build it as an entry for this build. The model is started but only the rear fuselage has been put together which still leaves a lot to do. Bear in mind that their overseas shipping is by surface mail only, which takes 4-8 weeks. Excellent stuff. I procured several sheets from them (e. g. for CF-101, CF-188 and CT-133), and all these were/are top notch. Thin carrier film, perfect register, good documentation. Another good source for Canadian aftermarket sheets is Leading Edge decals. Hm, I have an original MRCA kit somewhere too, one that was never destined to be built once the pukka Tonka kits came out. Maybe it will now? Now that got me wondering: what if one (or several) of these private adversary-air contractors bought some RAF Tornados to give the USAF a good workout against something that can credibly simulate an Su-24 or a Xian JH-7? Draken International markings here: https://www.oldmodelsdecals.com/RNZAF-current-a-c.html (scroll down) Sheets for Skyhawks and Mb-339s in 1/48th, 1/72nd and 1/144th scales. I've got a 72nd scale and a pair of 144ths somewhere in my never ending pile of half-builts. Good excuse right here ! Always depressing to see aircraft the maintainers worked so hard on reduced to junk. Well the F.3s were RTP'd in order to keep the GR.4s going, which might have been brutal, but was logical enough. When the GR.4s come out of service, the same incentive won't apply, so maybe there'll be a decent 'window' in which to snag some. Also, the decision to retire then this year was announced some time ago, so there's already been a opportunity for negotiations to take place.